On May 5, the Iowa Legislature completed its work for the 2018 session — well beyond the scheduled completion date of April 17. The session featured largely party-line votes on many policy bills and deep partisan divisions on State Fiscal Year (SFY) 2018 de-appropriations, SFY 2019 agency appropriations, and tax cut legislation. The Iowa-AAP was active throughout the 2018 session supporting legislation to ensure the healthy physical and mental development of children. 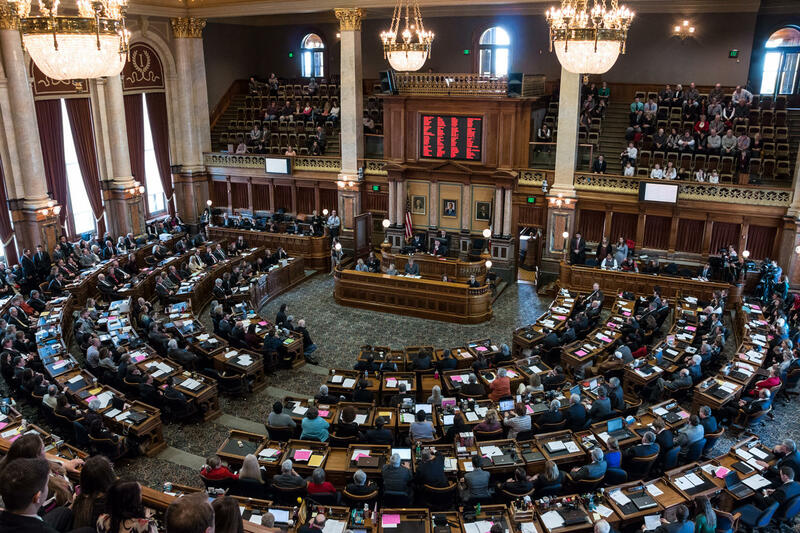 Following is a summary of legislative action on some of the 30-plus bills that Iowa-AAP supported, opposed, or registered undecided — along with links to blog posts and other resources. Abuse of Opioid Prescription Drugs: On May 2, the Iowa House gave final approval to legislation (HF 2377) to enhance Iowa’s Prescription Monitoring Program as a means to curtail physician or pharmacy shopping in opioids. The bill also encourages the reporting of drug overdoses through a “Good Samaritan” provision. For more on this bill, see this blog post or a summary in the Des Moines Register. Iowa-AAP supported. Safe Haven: On March 29, Governor Reynolds signed into law SF 360, which expands options for parents to legally abandon their newborns without being charged for abandonment. For more on Iowa’s Safe Haven law and this bill, see this blog post. Iowa-AAP was undecided. Pharmacy immunizations and Vaccinations: On May 2, the Iowa House approved legislation (SF 2322) allowing pharmacies, after state adoption of protocols, to begin administering certain vaccinations or immunizations. For adults, pharmacies can administer naloxone, Tdap, nicotine replacement products, and other immunization or vaccinations recommended by the CDC for travel or as part of an approved schedule for adults. For those 12 and older, pharmacies can administer the second and third doses of the HPV vaccine. The Iowa-AAP expressed opposition to expanded pharmacy vaccinations of youth because of the potential adverse impact on their seeking health care. Student Athlete Concussions: On April 26, the Governor signed legislation (HF 2442) to reduce the effects and recurrence of concussions in school sports, including: developing training materials for coaches and guidelines for school personnel and families; establishing rules governing returning to play following a concussion; and providing protective gear to students. Iowa-AAP supported. School Tracking of Student Health Care: On April 17, the Governor signed into law a lengthy education bill, (SF 475), that creates a student health working group to re-examine how schools track whether students have received dental or vision screenings or immunizations. Iowa-AAP opposed this legislation because of its potential to weaken how schools track student health events. Mandatory Reporter Training and Child Welfare Reform: The Iowa-AAP supported separate bills calling for DHS work groups to (a) identify how to improve training for mandatory reporters of child or dependent adult abuse (SF 2300) and (b) examine policies and protocols in multiple features of Iowa’s child protection system (HF 2353). Neither bill passed, but the health and human services appropriations bill (SF 2418) included a provision establishing a mandatory reporter training work group. Coverage for Hearing Aids: The Iowa-AAP supported legislation requiring health insurers to pay for hearing aids for children at least every three years (HF 2178). This bill but not advance, but the Legislature appropriated $156,482 to provide audiological services and hearing aids for children. Cigarette Tax Increase. Along with 31 other organizations, Iowa-AAP supported legislation (HF 2339) increasing Iowa’s cigarette taxes by $1.50 a pack in order to reduce teen and adult smoking and raise revenue for health promotion and treatment services. This bill did not receive a hearing. Recipient Work Requirements: Iowa-AAP opposed House (HF 2428) and Senate (SF 2370) legislation imposing work requirements on Medicaid recipients. The more punitive Senate bill imposed additional non-work requirements on Medicaid recipients and expanded them to people receiving SNAP (Food Stamps) and Family Investment Program (FIP) benefits. Both bills received committee approval but no chamber vote. Expanding Access to Care. The Iowa-AAP supported legislation to expand health care by: (a) helping mothers receiving pregnancy-related Medicaid to access health insurance post-partum (SF 11) and (b) restoring three-month retroactive eligibility for Medicaid (SF 2075). The Senate did not hold subcommittee meetings on these bills.